In most of the cases the error is indicating a missing host/base address section in the config file of the server. But, you can also host a service that is only providing net pipes binding in IIS and benefit from the Windows Process Activation Service (WAS). Using WAS you let IIS control your service and IIS ensures that the service is running and restarted if necessary, all things you need to address in self hosting. 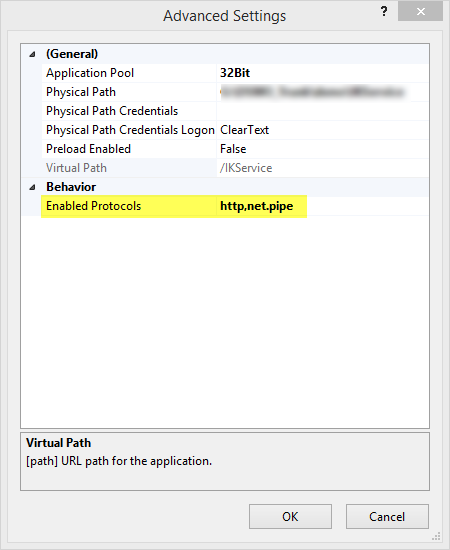 In the case of WAS services you can spare the above, endpoint protocol bindings are in fact defined in IIS and the subject’s exception message is indicating that the net.pipe protocol is not enabled in in the advanced settings of the IIS application. Most probably only the http protocol is enabled, which is the default. Just add net.pipe to the comma separated list and try to browse the service.